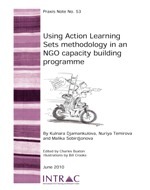 This note describes how the use of Action Learning Sets (ALS) methodology in Central Asia has enabled NGO leaders and staff to become effective in addressing organisational and operational challenges. This approach has contributed to the overall strengthening of their organisations. The experience of piloting ALS in Central Asia has shown it to be an invaluable tool for enabling NGO staff think through key programme issues of sustainability in self-help groups. It also helps with exploring internal organisational issues such as how to strengthen management systems and accountability. In the ever changing geopolitical context of Central Asia the ALS approach is essential for enabling NGOs to adapt and continue to be relevant and effective.